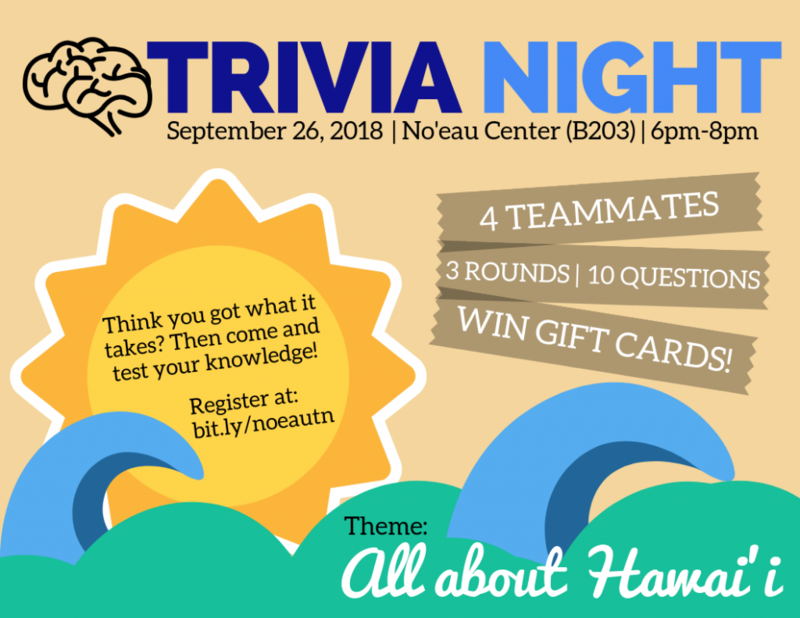 The Noʻeau Center will host a Trivia Night that will test teams of students on their knowledge of all things Hawaiʻi, with the top winning teams taking home gift cards. The event, the first hosted by Noʻeau Center, is scheduled to begin with a team check-in at 6 p.m., Wednesday, Sept. 24, at the center. The top winning team will receive a $100 Target gift card (to be divided among team members) while the second- and third-placed teams will receive cards of lesser value. The event is sponsored by the Student Activity Fee Board and will include chicken katsu and fried noodles so contestants don’t have to compete on an empty stomach. Students are encouraged to recruit up to three friends (four-member teams are the largest allowed) and to register ahead of time by going to bit.ly/noeautn. Only UH West Oʻahu students may compete. There will be three rounds, and each round consists of 10 questions whether it be about Hawaiʻi’s history, local culture, or geography. All questions are multiple choice and your team has 20 seconds per question to decide on an answer. Questions? Contact Rebecca Carino: rtcarino@hawaii.edu. Tagged Hawaii Trivia, Noeau Center, Trivia Night, University of Hawaii West Oahu, www. Bookmark the permalink.